We report for the first time use of 3D-printed metal extrusion dies for the extrusion of an optical material into an extrudate at elevated temperatures. Using lead-silicate glass as the material to be extruded, the 3D-printed dies demonstrated the same glass flow behavior as conventionally machined metal dies. Evaluation of the extrusion force at set temperature and extrusion speed revealed that the metal-type of the dies used did not affect the glass flow behavior. Using 3D-printed dies as delivered, the high surface roughness of the 3D-printed dies resulted in high preform surface roughness. However, this effect was overcome by finishing the easily accessible internal die surfaces over 1-2mm length upstream from the die exit. The opportunity of using 3D-printed dies offers unprecedented flexibility in the die design for unlimited tailoring of fluid flow within the die, which paves the way towards extruded items of arbitrary shape. T. Monro and H. Ebendorff-Heidepriem, “Progress in microstructured optical fibers,” Annu. Rev. Mater. Res. 36(1), 467–495 (2006). H. Ebendorff-Heidepriem and T. M. Monro, “Analysis of glass flow during extrusion of optical fiber preforms,” Opt. Mater. Express 2(3), 304–320 (2012). J. Bei, T. M. Monro, A. Hemming, and H. Ebendorff-Heidepriem, “Reduction of scattering loss in fluoroindate glass fibers,” Opt. Mater. Express 3(9), 1285–1301 (2013). G. Tao, S. Shabahang, E.-H. Banaei, J. J. Kaufman, and A. F. Abouraddy, “Multimaterial preform coextrusion for robust chalcogenide optical fibers and tapers,” Opt. Lett. 37(13), 2751–2753 (2012). H. Ebendorff-Heidepriem, T. Monro, M. A. van Eijkelenborg, and M. C. J. Large, “Extruded high-NA polymer microstructured fiber,” Opt. Commun. 273, 133–137 (2007). S. Atakaramians, S. Afshar V, H. Ebendorff-Heidepriem, M. Nagel, B. M. Fischer, D. Abbott, and T. M. Monro, “THz porous fibers: design, fabrication and experimental characterization,” Opt. Express 17(16), 14053–15062 (2009). S. Atakaramians, K. Cook, H. Ebendorff-Heidepriem, S. Afshar V., J. Canning, D. Abbott, and T. M. Monro, “Cleaving of extremely porous polymer fibers,” IEEE Photonics Journal 1(6), 286–292 (2009). V. V. R. K. Kumar, A. K. George, W. H. Reeves, J. C. Knight, P. St. J. Russell, F. G. Omenetto, and A. J. Taylor, “Extruded soft glass photonic crystal fiber for ultrabroad supercontinuum generation,” Opt. Express 10(25), 1520–1525 (2002). P. Petropoulos, H. Ebendorff-Heidepriem, V. Finazzi, R. Moore, K. Frampton, D. J. Richardson, and T. M. Monro, “Highly nonlinear and anomalously dispersive lead silicate glass holey fibers,” Opt. Express 11(26), 3568–3573 (2003). J. Y. Y. Leong, P. Petropoulos, J. V. H. Price, H. Ebendorff-Heidepriem, S. Asimakis, R. C. Moore, K. Frampton, V. Finazzi, X. Feng, T. M. Monro, and D. J. Richardson, “High-nonlinearity dispersion-shifted lead-silicate holey fibers for efficient 1-µm pumped supercontinuum generation,” J. Lightwave Technol. 24(1), 183–190 (2006). H. Ebendorff-Heidepriem and T. M. Monro, “Extrusion of complex preforms for microstructured optical fibers,” Opt. Express 15(23), 15086–15092 (2007). X. Feng, F. Poletti, A. Camerlingo, F. Parmigiani, P. Horak, P. Petropoulos, W. H. Loh, and D. J. Richardson, “Dispersion-shifted all-solid high index-contrast microstructured optical fiber for nonlinear applications at 1.55 microm,” Opt. Express 17(22), 20249–20255 (2009). H. Ebendorff-Heidepriem, Y. Li, and T. M. Monro, “Reduced loss in extruded soft glass microstructured fibre,” Electron. Lett. 43(24), 1343–1345 (2007). H. Ebendorff-Heidepriem, S. C. Warren-Smith, and T. M. Monro, “Suspended nanowires: Fabrication, design and characterization of fibers with nanoscale cores,” Opt. Express 17(4), 2646–2657 (2009). K. J. Rowland, H. Ebendorff-Heidepriem, S. Afshar, and T. M. Monro, “Antiresonance guiding in soft-glass hollow-core microstructured fibres; fabrication and spectra properties,” Australian Conference on Optical Fibre Technology (ACOFT‘2009), Adelaide, 29 Nov – 3 Dec 2009, paper 161. S. C. Warren-Smith, H. Ebendorff-Heidepriem, T.-C. Foo, R. Moore, C. Davis, and T. M. Monro, “Exposed-core microstructured optical fibers for real-time fluorescence sensing,” Opt. Express 17(21), 18533–18542 (2009). H. T. C. Foo, H. Ebendorff-Heidepriem, C. J. Sumby, and T. M. Monro, “Towards microstructured optical fibre sensors: surface analysis of silanised lead silicate glass,” Journal of Materials Chemistry C 1(41), 6782–6789 (2013). K. J. Rowland, H. Ebendorff-Heidepriem, S. Afshar, G. Tsiminis, and T. M. Monro, “Extruded soft glass single-ring hollow core fibres”, Australian and New Zealand Conference on Optics and Photonics (ANZCOP’2013), Fremantle, Western Australia, Australia, 8–11 Dec 2013. M. Trabelssi, H. Ebendorff-Heidepriem, K. C. Richardson, T. M. Monro, and P. F. Joseph, “Computational modeling of die swell of extruded glass preforms at high viscosity,” J. Am. Ceram. Soc. (accepted). V. V. Kumar, A. K. George, J. C. Knight, and P. Russell, “Tellurite photonic crystal fiber,” Opt. Express 11(20), 2641–2645 (2003). X. Feng, T. M. Monro, V. Finazzi, R. C. Moore, K. Frampton, P. Petropoulos, and D. J. Richardson, “Extruded singlemode, high-nonlinearity, tellurite glass holey fibre,” Electron. Lett. 41(15), 835–836 (2005). M. R. Oermann, H. Ebendorff-Heidepriem, D. J. Ottaway, D. G. Lancaster, P. J. Veitch, and T. M. Monro, “Extruded microstructured fiber lasers,” IEEE Photon. Technol. Lett. 24(7), 578–580 (2012). H. Ebendorff-Heidepriem, K. Kuan, M. R. Oermann, K. Knight, and T. M. Monro, “Extruded tellurite glass and fibers with low OH content for mid-infrared applications,” Opt. Mater. Express 2(4), 432–442 (2012). H. Ebendorff-Heidepriem, P. Petropoulos, S. Asimakis, V. Finazzi, R. C. Moore, K. Frampton, F. Koizumi, D. J. Richardson, and T. M. Monro, “Bismuth glass holey fibers with high nonlinearity,” Opt. Express 12(21), 5082–5087 (2004). W. Q. Zhang, H. Ebendorff-Heidepriem, T. M. Monro, and S. Afshar V., “Supercontinuum generation in bismuth microstructured optical fiber with three zero dispersion wavelengths,” Opt. Express 19, 21135–21144 (2011). H. T. Munasinghe, A. Winterstein-Beckmann, C. Schiele, D. Manzani, L. Wondraczek, S. Afshar V., T. M. Monro, and H. Ebendorff-Heidepriem, “Lead-germanate glasses and fibers; a practical alternative to tellurite fore nonlinear fiber applications,” Opt. Mater. Express 3, 1488–1503 (2013). E. T. Y. Lee, “Development and characterisation of phosphate glasses for athermalisation,” PhD thesis, University of Southampton (2004). D. Furniss and A. Seddon, “Towards monomode proportioned fibreoptic preforms by extrusion,” J. Non-Cryst. Solids 256-257, 232–236 (1999). Z. G. Lian, Q. Q. Li, D. Furniss, T. M. Benson, and A. B. Seddon, “Solid microstructured chalcogenide glass optical fibers for the near- and mid-infrared spectral regions,” IEEE Photon. Technol. Lett. 21(24), 1804–1806 (2009). G. Tao, A. F. Abouraddy, and A. M. Stolyarov, “Multimaterial fibers,” Int. J. Appl. Glass Sci. 3(4), 349–368 (2012). K. Bhowmick, H. P. Morvan, D. Furniss, A. S. Seddon, and T. M. Benson, “Co-extrusion of multilayer glass fiber-optic preforms: Prediction of layer dimensions in the extrudate,” J. Am. Ceram. Soc. 96(1), 118–124 (2013). K. Itoh, K. Miura, I. Masuda, M. Iwakura, and T. Yamashita, “Low-loss fluorozirco-aluminate glass fiber,” J. Non-Cryst. Solids 167(1-2), 112–116 (1994). H. Ebendorff-Heidepriem, T.-C. Foo, R. C. Moore, W. Zhang, Y. Li, T. M. Monro, A. Hemming, and D. G. Lancaster, “Fluoride glass microstructured optical fiber with large mode area and mid-infrared transmission,” Opt. Lett. 33(23), 2861–2863 (2008). H. Ebendorff-Heidepriem, D. G. Lancaster, K. Kuan, R. C. Moore, S. Sarker, and T. M. Monro, “Extruded fluoride fiber for 2.3μm laser application”, International Quantum Electronics Conference (IQEC)/The Conference on Lasers and Electro-Optics (CLEO) Pacific Rim Conference, Sydney, Australia, Aug-Sep 2011. 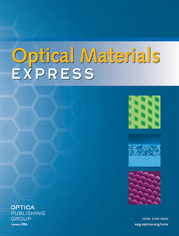 J. Bei, T. M. Monro, A. Hemming, and H. Ebendorff-Heidepriem, “Fabrication of extruded fluoroindate optical fibers,” Opt. Mater. Express 3(3), 318–328 (2013). C. A. G. Kalnins, H. Ebendorff-Heidepriem, N. A. Spooner, and T. M. Monro, “Radiation dosimetry using optically stimulated luminescence in fluoride phosphate optical fibres,” Opt. Mater. Express 2(1), 62–70 (2012). C. R. Garcia, R. C. Rumpf, H. H. Tsang, and J. H. Barton, “Effects of extreme surface roughness on 3D printed horn antenna,” Electron. Lett. 49(12), 734–736 (2013). S. Leuders, M. Thöne, A. Riemer, T. Niendorf, T. Tröster, H. A. Richard, and H. J. Maier, “On the mechanical behaviour of titanium alloy TiAl6V4 manufactured by selective laser melting: Fatigue resistance and crack growth performance,” Int. J. Fatigue 48, 300–307 (2013). R. Hölker, A. Jäger, N. B. Khalifa, and A. E. Tekkaya, “Controlling heat balance in hot aluminum extrusion by additive manufactured extrusion dies with conformal cooling channels,” International Journal of Precision Engineering and Manufacturing 14(8), 1487–1493 (2013). Kumar, V. V. R. K.
Fig. 1 Schematics of die profiles in axial direction and of the glass flow direction for the two die designs used in this study. Fig. 2 (a) Die constant calculated using the extrusion processing parameters and (b) cross-sectional area of the die welding chambers of the four extrusion trials considered here. Fig. 3 Optical profiler images of 3D-printed Ti alloy die (a) media-blasted surface and (b) smoothed surface using conventional machining tool, and optical profiler image of (c) conventionally machined steel die surface. Details of die surface treatment are given in the text. The images have different vertical scale. The total range of the vertical scale is given as Δz. The average Sq values for the corresponding surfaces are also given. Fig. 4 Optical profiler images of F2 glass preforms of extrusion trials A-E. The preforms were extruded through 3D-printed and conventionally machined dies. The images have different vertical scale. The total range of the vertical scale is given as Δz. The average Sq values for the corresponding surfaces are also given. Fig. 5 Surface roughness Sq of (a) dies with different surface finish, and (b) preforms of the four extrusion trials considered here. Note the different Sq scale for the die and preform surfaces. Table 1 Die design and metal type, ram speed v0, extrusion set temperature Tset, die temperature Tdie, log of the glass viscosity ηglass, ram force F, welding chamber cross section Achamber, and die constant Kdie calculated using the extrusion conditions for the four extrusion trials considered in this study. Die design and metal type, ram speed v0, extrusion set temperature Tset, die temperature Tdie, log of the glass viscosity ηglass, ram force F, welding chamber cross section Achamber, and die constant Kdie calculated using the extrusion conditions for the four extrusion trials considered in this study.